Prentice, Ana Maria - Groelle & Salmon P.A. Ana Maria Prentice is an associate attorney at Groelle & Salmon’s Miami office. Mrs. Prentice earned her Bachelor’s degree in English from the University of Miami, and she earned her Juris Doctor from the University of Miami School of Law. Prior to joining Groelle & Salmon, Mrs. Prentice gained a substantial amount of litigation experience as a State Attorney. 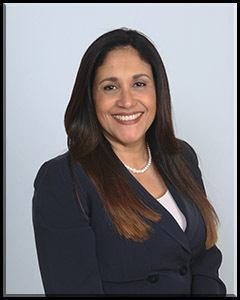 Her legal experience includes clerking for the City of Miami City Attorney’s Office, in the Labor and Employment Division, and providing litigation support to Independent Counsel for the City’s Civilian Investigative Panel. Additionally, Mrs. Prentice was an Attorney with the Department of Children and Families in Miami, where she practiced as the designated attorney for Dependency Drug Court. In Broward, Mrs. Prentice continued advocating for Florida’s abused, abandoned, and neglected children, as an Assistant Attorney General with Children’s Legal Services. There she managed a demanding caseload and prosecuted numerous cases. Mrs. Prentice has now transitioned her litigation experience into civil practice here at Groelle & Salmon in the area of Property Insurance Defense.